HAS THE IDEA 'HIT' THE NET WITH HALF A MILLION CLICKS? The idea of 'The Religionless World' was floated by me on the internet, by launching this website in mid Feb, 2013 using a fast growing smart web hosting site weebly.com. However, in order to promote and propagate my message, to reach a global audience, I created a brief profile, using a trendy web hosting service, about.me.com in May, 2013. This is a 'One Page' sleek website posted by me on about.me.com to showcase and draw public attention, on the issue of religious reforms and the promotion of universal spiritual values. 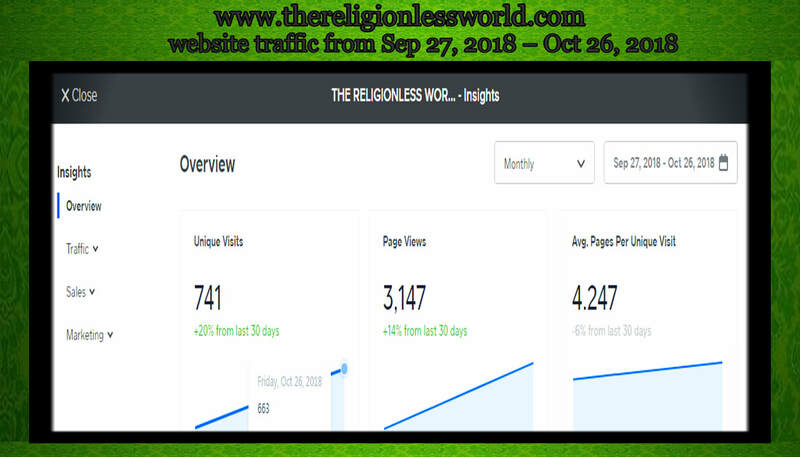 Link of website www.thereligionlessworld.com was spotlighted on webpage http://about.me/sureshsoni prominently, to bring visitors on the website to back my kickstarter. The number of ‘Views’ on the webpage has exceeded half a million mark. The exact number of 'views' as on Dec 02, 2014 was 500,046. This is a encouraging sign. Statistics reveal, people are not averse to the idea of a 'Religionless World', nor are they disinclined to discuss religious reforms in public. I am overwhelmed by this response. This has rejuvenated my confidence, to push the plan further, or else, I was so disheartened that I had decided to drop the plan. I thank all the viewers, from the bottom of my heart, for their support and kind words. By using social media, I have managed to get, different responses, both growth and challenge oriented, besides it has helped me, create new social connections worldwide, and has offered me, a platform for collaboration, and a free internet service, to transmit my message, across the world. What more can I ask. Internet is now an inseparable part of our routine life. Is 'Virtual World' becoming bigger and stronger? Let us welcome this great change, and at the same time, resolve the shortcomings, if any, even if, internet is replacing conversation and human feelings are becoming a status update. Notwithstanding otherwise, the ‘Social Media’ has ushered a new age, by connecting people across the world, and bringing them closer, as a single community, never seen before, in the history of mankind, it has opened up, a plethora of possibilities, for people to express and exchange, their views freely, a privilege people must use discreetly, with discretion and responsibility. I am really grateful and proud to be a part of this fast changing, mode of social communication, and social connections. The best is yet to come. So, keep the 'Windows' open, for new and advanced technologies to enter. Technology is like a river, whose running water is never same, it changes every moment, by the flow of the gushing stream. ﻿Readers, I thank you for the support. The idea of a ‘Religionless World’ is gaining momentum around the world, and picking up steam at a time, when ‘Arab-Israeli’ and ‘India-Pakistan’ clashes are seen, as complicated conflicts by the world. Is national interest or religious interest, the forerunner of these conflicts, taking place in the world today? If nuclear nations go on war, God save the world. In such dire circumstances, if we cannot discuss the matter right now, then when are we going to do it. Whether we can make a difference or not is up to 'You' ~ the reader, the people, the world leaders, the law makers, who should by all means come forward, to initiate a public discourse, and through a general consensus, bring a peaceful, non-violent cultural revolution, to enhance spiritual growth, and the development of human race, with everlasting peace and prosperity on planet earth. On Nov 02, 2015, Dev Samudre, Pune representative of CREATIVE AWARENESS TRUST spoke to students of 1st year of MCA class in Art, Commerce and Information Technology College, Chinchwad, Pune, He gave a lecture on the topic “The key to success comes from right understanding and spiritual values, and not by relying on wrong information, false religious beliefs and superstitions. He also met Principal of the college Dr. Dhananjay Bagul and had a fruitful discussion on sponsoring and supporting spiritual values in general public, so as to strengthen the edifice of goodwill and brotherhood, among diverse faith followers of religions in our society. Today i.e. Feb 21, 2016. I am celebrating, my third work anniversary. On Feb 21, 2013, I had launched the project ‘THE RELIGIONLESS WORLD’, which actually means the 'Spiritualization Of Mankind'. Besides, following related websites were also launched by me separately. Looking back, on years gone by, ground realities emerge, to put in place, a picture, that suggests, changing the ‘Religious Mindset’ of faith followers, to a ‘Spiritual’ state of mind is a Herculean task, indeed. As ‘Faith Followers’ still prefer, to grow up, and develop, the way religions decides, to turn them out to ‘BE’. Despite, this shortsightedness, the project has successfully managed, to penetrate and push, the milieu and message of SPIRITUALITY, through social media, without any fuss and flurry, thus creating an accredited awareness, among a large number of people, world over. Spirituality is the ‘SOUL’ of all religions. Spirituality is the ‘Single Path’ that does not threaten ‘Religions’ or ‘Faith Followers’, as atheism does, atheism survives on the continuation of religions. But, the noble work, on Spiritual dissemination, distribution and diffusion is a ‘SELFLESS’ work, it's an evolutionary process and not an ideology, much beyond the scope of religions and atheism. Because spiritual matters are best served, without any intention, to gain name, fame or fortune, I am, therefore, earnestly working ‘Selflessly’ for a righteous cause, I believe in, and not for any notable applause, which I shun. I have no hidden agenda, I have, the message of truth, to convey, to the world. That's all, and nothing more. The trigger to transform mankind in ancient age was ‘Reason’, in medieval age it was ‘Religion’. In modern age, it was ‘Science & Technology. In the age of globalization, inner transformation of man will happen through ‘Spiritual insight’. ​Main problem confronting me is that, religions have created a big absurdity. All faith-followers still, continue to believe in lies, even if they are told about ‘Truth’, though in the end, its truth that triumphs. This gives hope. Notwithstanding otherwise too, in a world full of lies, people are still, inspired by truth, and eventually, the truth of spirituality is far better, than the truth of all religions. It’s interesting to note, during the intervening period, significant developments have taken place. Pope Francis, the top religious leader of the world, spoke about spiritual values, and accepted the notion of one God, laying the foundation of one world religion, and Ayatollah Khamenei, leader of Iran, held that terrorist movements are not in sync with Islamic ideology, due to deviant and wrong interpretation of Islam. Even Saudi Crown Prince Mohammed Bin Salman Al Saud, has announced that 34 Islamic countries, will partner in the fight against ‘Islamic Extremism. World’s most powerful leader US President Barack Obama opined that extremist ideology is a real problem that Muslims must confront. Prime minister of world’s most populous country Narender Modi has eulogized the spiritualization of mankind. While British Prime Minister David Cameron, French President François Hollande, Russian President Vladimir Putin and Chinese President Xi Jinping have condemned religious fundamentalism, in strong words. In Australia and New Zealand, the percentage of people, reporting NO RELIGION is increasing fast. So, it’s quite evident; that people around the world, are now drifting away from redundant religions, and are becoming spiritual. The sound of death-knell of religions is ringing, as the time of ‘Spiritual Awakening’ has finally arrived. I know there is no ‘TIMELINE’ for fruition of the proposal, so I shall not look back, to see how far, I have come, because I have, still to go, a very long way. My journey isn’t over, and the woods around me, are dark and deep. Nor can I give up this project, when I know; it’s what the majority of the people want. Losing illusion will make them find truth. I have the opportunity at hand, if I delay, it’s gone. As, I have to go forward, so I have to quit looking back. I am doing what I have to do. Hard work, dedication and vision are necessary, to make further progress, in the years to come, before I go to sleep, in the twilight of my life, never to wake up again. I am not worried about it, since I see, the hand of our deliverance is, lifting us, from darkness to light. ​Currently, it hurts me deeply, eyes well up with tears, and heart bleeds, when a man kills a man in the name of religion. This is a criminal act that disqualifies the sanctity of religions. Let us abandon redundant religions, join hands, and allow the ‘SPIRITUALIZATION OF MANKIND’ to happen, as the futuristic religion of 21st century. There is no rule, I suggest must occur. It is up to us, to stir to action, or wait passively, for the outcome. Anyhow, what may come, humanity has to pass over, to the other side, no matter, what the circumstances are, and discover, what natural and divine forces, have planned for us, in future. Further, I would like to inform that I have started a non-profit organization called the ‘CREATIVE AWARENESS TRUST’ on a shoestring budget in Oct, 2014, to pursue the aim of ONENESS [ONE WORLD & ONE MANKIND], despite the fact, that nowadays, public opinion is shaped by fear, coercion, distraction and creating divisions, making it difficult for others, to propagate the message of ‘Oneness’ in public domain. While concluding, I salute and thank each one of you, who has congratulated me, for my work, I convey my warm wishes, for backing me, and my mission, with kind words and moral support. You are the one, who motivate, and give me strength, to push my mission, to its logical conclusion. I thank you, my supporters, from the bottom of my heart, and with utmost humility, urge others readers, as well, to relook, the stand and position, they would like to take, on the global problems created by religions. I request the readers, to join and support this campaign, or else, they can assist me, at their own end, by spreading the message of the proposal, through word of mouth, or by sharing this post, among people they know. 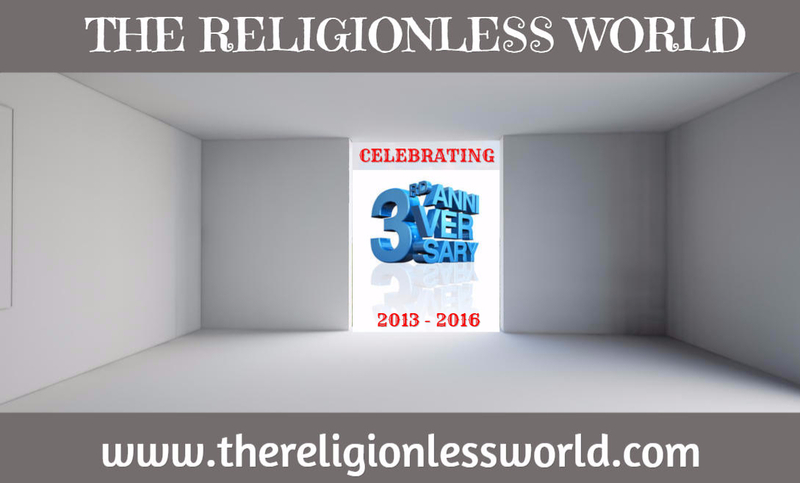 'The Religionless World' website www.thereligionlessworld.com was launched in Feb 2013. 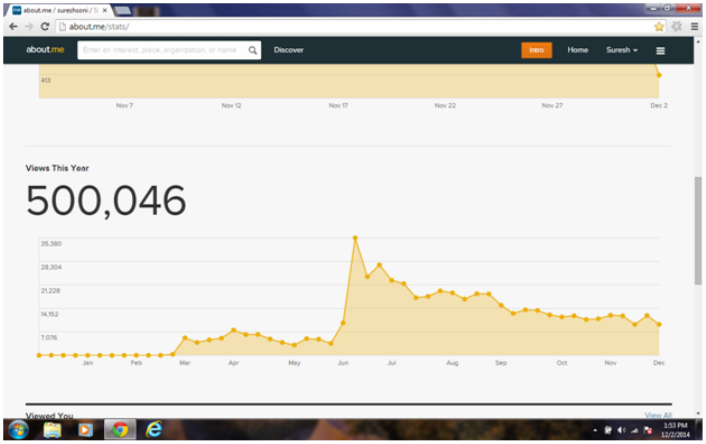 During the year 2014, the number of ‘Views’ or ‘Clicks’ on the webpage’s had exceeded half a million mark. Yesterday, I had a quick look at the graph of the website traffic during this month from Sept 27, 2018, to Oct 26, 2018. The website had 3147 views, which means on an average the website attracts more than 100 views per day. I am grateful to each website visitor and wish more and more people glance at the website so that the trend to create public awareness to ‘Reform Religions’ continues. Thank you very much.